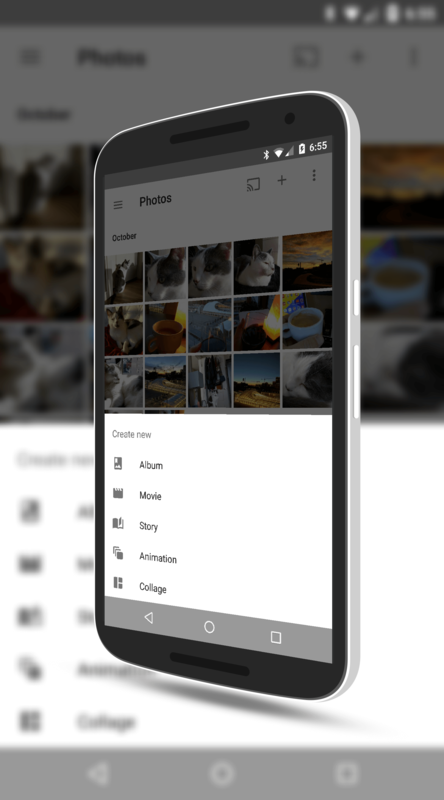 Google Photos has become one of the more powerful photo viewing, storing and editing apps available for Android phones and tablets (as well as a really good website). While there are more powerful editing apps out there, Google Photos will meet the need for the vast majority of users and with the ability to store your photos in your Google Drive, you always have a backup of your photos. A great feature of Google Photos is the Assistant feature. This feature automatically creates movies, stories and enhanced photos of those you have uploaded to the service and some of them are really good. You can chose if you want to keep what the assistant creates or not and it allows you to painlessly add some creativity to your photos. However, there may be a time where you want to create a movie of your photos yourself. Google has made it easy to do and in this How To I will show you the steps to take to create a movie in Google Photos. select Movie. You will also see that you can create a new album, Story, Animation or Collage from this menu too. You will now need to select the photos and videos that you want to include in your new Movie. You can select up to 50 photos and videos for it and once you have selected them, tap the Create button in the upper right corner. This will build your video and once the building is complete, you can view your video by tapping the play button. On the video display you can add filters to your video to create different effects and when you select an effect you can preview it prior to committing it to the video. Also, you can change the music that is playing in the background to better fit the theme of your video. Once you are done adding the effects & music, give your movie a title and everything is automatically saved for you to your Google Photos account. With your video created, you can also easily share that video to other services like YouTube, Gmail and so forth to share it with friends and family. For this How To I created a simple video and put it over on my YouTube channel to give you a feel for what you can do with the app when it comes to creating a movie from your photos. This video was created on my Nexus 6 using the Google Photos app. What do you do if the Movie option isn’t available? How are you supposed to do it then? This is something Google controls. You don’t have an option to enable it.